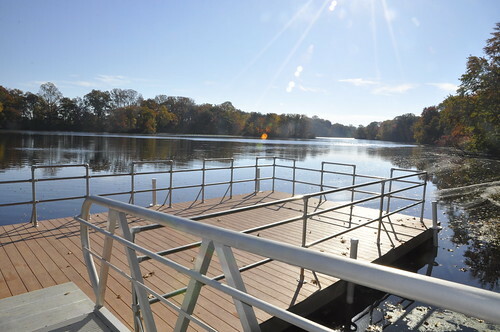 The Maryland Department of Natural Resources has opened a new floating fishing pier and gangway at the Unicorn Lake Fisheries Management Area that meets the Americans with Disabilities Act Accessible Design Standards of 2010. The department worked with the Maryland Department of Disabilities and the Department of General Services to create this fully-accessible freshwater fishing pier on state land. The new 448-square-foot floating pier, located next to the boat launch, has enough space to accommodate multiple anglers. The aluminum gangway to the pier is adjacent to a newly constructed parking space and portable bathroom. Funding for the $100,000-project was provided through the Maryland Department of Disabilities’ Access Maryland Program. The 43-acre Unicorn Lake was selected for the grant because of its physical location, construction logistics and great fishing opportunities for largemouth bass, chain pickerel and panfish. Access Maryland coordinates with state agencies and universities to identify key accessibility projects that increase access to facilities across Maryland.